What is behind the postponing of a high-level Central American 'Conference on Security and Prosperity,' which was scheduled for next week? Muddled policy and a lack of U.S. leadership. Despite President Trump’s manufactured border crisis, a bipartisan foreign policy success story of recent years has been addressing the root causes of migration from Central America’s Northern Triangle - El Salvador, Guatemala and Honduras - to the United States. That is now in jeopardy. Members of Congress from both parties, Trump’s own UN Ambassador Haley and USAID Director Mark Green all realize that it is cheaper, more efficient, and less politically contentious to address the push factors of irregular migration from Central America in Central America, rather than deal with the consequences of them at our southwest border. Mitigating the violence, the lack of economic opportunity, and weak institutionality in those three nations was never going to be easy. It was always going to require full stakeholdership by the Central American governments, and sustained U.S. attention and effort over time. Those of us charged with implementing Bush and Obama policy in Central America knew this, and we knew that the first thing we had to do was keep the Central American governments focused on doing things that weren't necessarily in their interest - like investigating and prosecuting corrupt officials and police. Secondly, we understood that maintaining U.S. focus and commitment of attention and resources was difficult but essential. In other words, we had to keep our eye on the ball. While by no means “solved,” we made steady progress. But now, events that have nothing to do with irregular migration are jeopardizing this bipartisan success story. A high-level "Conference on Security and Prosperity," focused on the Northern Triangle and scheduled for next week in Washington, has been postponed. This conference, like a previous DHS-led meeting last June in Miami, was meant to deepen bilateral and multilateral cooperation to stop irregular migration. Media report that officials from El Salvador and Guatemala decided to cancel at the last minute. Why would these governments, previously enthusiastic about proving that they are important security partners of the United States, cancel an important opportunity to meet with high-level U.S. counterparts? Our answer: policy drift, inattention to the region, and the Trump Administration’s improper conflation of issues. When Panama and the Dominican Republic cut ties with Taiwan and recognized the Peoples Republic of China, the U.S. government reacted with a yawn. It now appears to have awakened with El Salvador’s recent switch in August (NB: a good thing in the authors’ opinion). The State Department announced on September 7 it was recalling for consultations its Chiefs of Mission from El Salvador, Panama and the Dominican Republic. While not linked directly to the immigration issue, China's commercial encroachment in Latin America is a reality and the United States appears to be paying attention finally, but perhaps to the detriment of needed development and security cooperation. In Guatemala, the government of President Jimmy Morales recently decided, along with Honduras, to move its Embassy from Tel Aviv to Jerusalem, clearly just to ingratiate itself with the Trump Administration. Although the U.S. stiffed Honduras by not renewing Temporary Protected Status, Morales may have received a tacit quid pro quo. When he recently decided to end the mandate of the United Nations- and U.S.-sponsored anti-corruption mission, known as CICIG, Secretary of State Pompeo’s tweet seemed to give Morales a pass on shuttering the most effective anti-corruption and impunity body in the region. He wrote, "Our relationship with Guatemala is important. 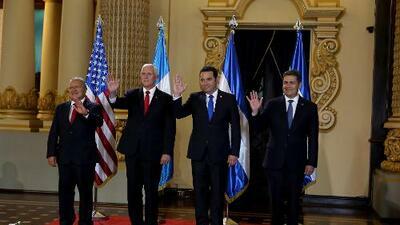 We greatly appreciate Guatemala's efforts in counternarcotics and security." No mention of CICIG or Guatemala's rollback on anti-corruption efforts, presumably because of Administration gratitude for the Jerusalem move. After strong reactions from civil society and members of Congress, Pompeo called Morales on September 6. A readout from Spokesperson Heather Nauert says in part that "The Secretary expressed continued support of the United States for a reformed CICIG ...". No mention of what a reformed CICIG might look like, or whether Pompeo asked Morales to let CICIG continue to operate in Guatemala. But Morales' decision not to participate in the Washington conference makes us assume that Washington wasn't as grateful as he'd hoped. We’ve heard that the Trump Administration pressed the Central Americans to attend the conference even though the dates conflicted with their National Day celebrations. When the Administration wouldn’t budge, they cancelled. Imagine our President attending a conference overseas instead of July 4 th celebrations at home. So, we're left with a cancelled conference, recalled Ambassadors, and ambiguity on the part of the U.S. regarding anti-corruption efforts. But most of all, we're left with a palpable sense that the strong U.S. leadership with the Northern Triangle countries to stop the flow of irregular migrants to the United States has lost considerable momentum. And in part, for foreign policy reasons - China, Israel's capital - that have nothing to do with migration. This is how good policy begins to unravel. Outside issues intervene, and our eye comes off the ball. One thing hasn't changed. The best way to keep Central Americans at home is to help them create conditions so that they see their futures at home and not in the United States.